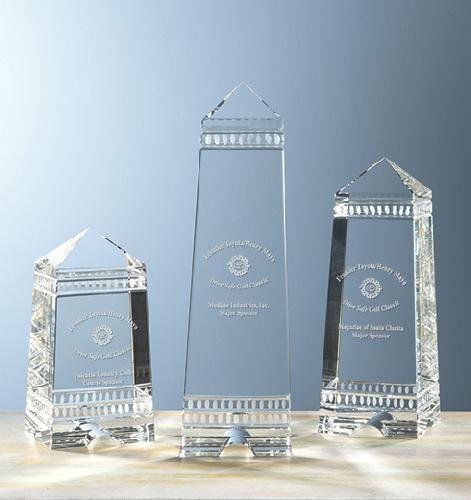 Our Parthenon Obelisk Award features decorative border cuts and a distinctive notched base. It is made of shimmering optical crystal and is available in three sizes. This slim, rectangle plaque is made from starphire glass, slid into a 2-tiered rubber base. Accented by an aluminum column on each side. A mezmorizing award designed after a peacocks tail. Use this award when you want to really wow the recipient. 3 1/2" x 3 1/2" x 2 3/8"
4 1/2" x 3 1/2" x 2 3/8"
5 1/2" x 3 1/2" x 2 3/8"